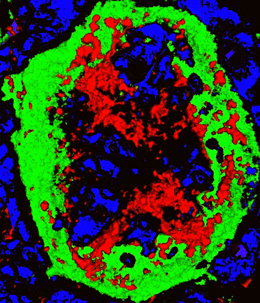 In atherosclerosis, fatty “plaques” form in the inner layer of arteries. As an LMU team now shows, specialized lymphoid organs found on the outer arterial wall adjacent to plaques help to restrain the inflammation that boosts plaque growth. Atherosclerosis is characterized by the appearance of abnormal fat-rich deposits – called atherosclerotic plaques – in the inner layer of major arteries, between the endothelial cell layer that faces the bloodstream and the muscle cells that regulate blood pressure and maintain the integrity of the arterial wall. These deposits provoke a localized inflammation reaction that becomes chronic, thus stimulating further plaque growth. The plaques obstruct blood flow, and may eventually block it entirely, precipitating a heart attack or a stroke. Chronic inflammatory responses result from a failure of the immune system to resolve the initial, acute reaction. “But, in principle, the immune system is capable of restraining the inflammation at sites of plaque formation in the arteries,” says Professor Andreas Habenicht of LMU’s Institute for Prophylaxis and Epidemiology of Cardiovascular Disease (Director: Prof. Christian Weber). Habenicht‘s team, in cooperation with groups based both in Germany and abroad, has now shown that so-called artery tertiary lymphoid organs (ATLOs) that develop in the outer layer of arteries opposite atherosclerotic plaques can indeed interrupt the inflammation process. The researchers report the new findings in the journal “Immunity”. Precisely what precipitates the formation of atherosclerotic plaques is still not entirely clear. Smoking, obesity, hypertension, diabetes, high lipid levels, and lack of physical activity all contribute to the development of the condition. But the disease process often begins quite early and is, at least to some degree, an element of the normal aging process. “Using a special mouse strain that has high blood cholesterol levels as an experimental model, we have observed that, as the animals get older, circulating immune cells infiltrate the inner layer of the arterial wall, and tertiary lymphoid organs form in the adventitial (outer) layer – directly opposite to the sites where plaques arise,” Habenicht explains. The ATLOs are morphologically similar to normal lymph nodes. However, unlike key components of the lymphoid system that differentiate during embryogenesis – such as the spleen or the tonsils – ATLOs develop in response to chronic inflammation during the aging process in adult organisms. They may be regarded as a kind of local branch office of the immune system, which opens up for business only in locations where needed. These findings demonstrate that ATLOs serve as regulatory communication centers that help to control local immune responses in atherosclerosis, and perhaps also in other conditions associated with unrestrained inflammation and in many types of cancers. They therefore represent an important and previously overlooked target for new therapeutic strategies. “Our results suggest that it should be possible to isolate and molecularly characterize the atherosclerosis-specific immune cells. We could then learn more about their function and, in the longer term, make use of them to develop new treatment options,” Habenicht says. “Someday, it might even be possible to develop a vaccine against atherosclerosis – but that goal is a long way off,” he adds.